This post is sponsored by Bing. Only Bing brings the best search and the best people from your favorite social networks, like Facebook and Twitter, together to help you spend less time searching and more time doing. It’s amazing what you can do when your friends are part of your search. Before you even begin to consider hatching your own eggs, there are a few things you need to think about! First of all, if all goes to plan, what will happen to your chicks/ducklings? Do you have appropriate (lifetime) accommodation for them? Can you offer all of them a good home? What will you do if all your little eggs turn out to be cockerels that don’t get along with each other? Can be sure you’ll be home during the entire incubation period and for the critical first few weeks post-hatch? 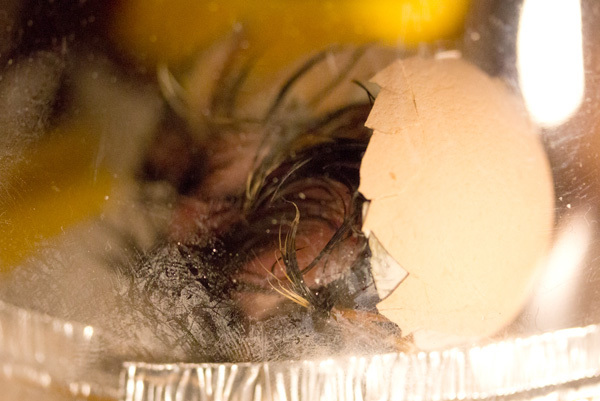 Hatching can be very rewarding, but it is something you need to undertake responsibly. After all you are bringing lives into the world, and that’s not something to be taken lightly! There are entire encyclopedias on the subject of incubation, so I can’t possibly fit it all in, but here are a few tips we’ve found useful in our hatching and a taste of the types of things to consider! Best of luck with your own broods! There is a huge range of incubators available, from the very basic to the fully automated. Some people even build their own incubators (see this styrofoam model via Instructables). Ultimately, the type of incubator you want to get probably depends on the level of involvement you can have during the incubation period. We’ve been hatching using one of the most basic models, the Brinsea Mini Eco Advance, shown on the left, in which pretty much everything but the temperature must be controlled manually. Despite being quite a hands-on process, we’ve had a good hatch rate with the Eco Advance. However it is quite a bit more work than more sophisticated models! We’ve also recently started with one of their octagon models on the right, which is also fairly labor intensive! You can acquire fertilized eggs from breeders, farm shops and even Ebay or collect your own. If you are collecting your own eggs, you should do so a few times a day (particularly in warm weather). 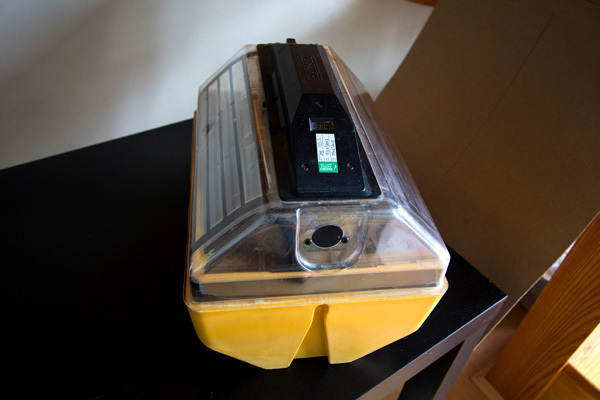 Eggs should be stored in eggboxes with the wide end up. Ideally they should be kept somewhere cool and humid (about 55F and 75% relative humidity). Avoid the temptation to clean them! Eggs have a natural coating that protects them from bacteria to some extent, and any attempt at cleaning you make might remove that and introduce diseases or bacteria through the pores. Fresh eggs are best, as viability declines after about a week. 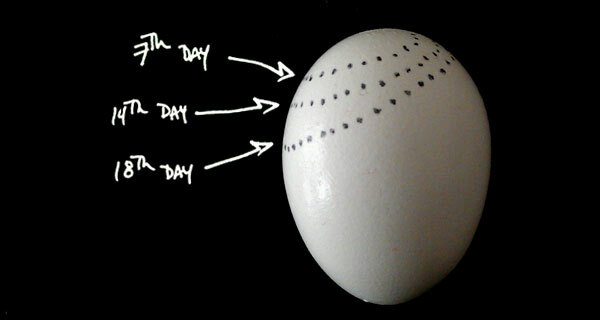 If you are storing your eggs for more than 3 days, the eggs’ position should be changed. 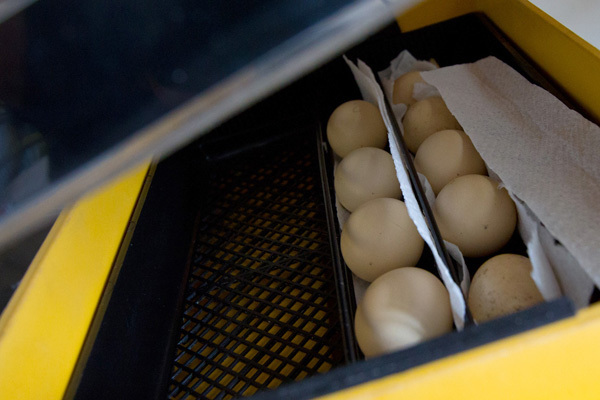 Get your incubator up and running before you plan to set the eggs. They do tend to hum, so keep this in mind when picking a location! Incubators tend to work best if kept in a room with minimal temperature fluctuations, so avoid direct sunlight and drafts. 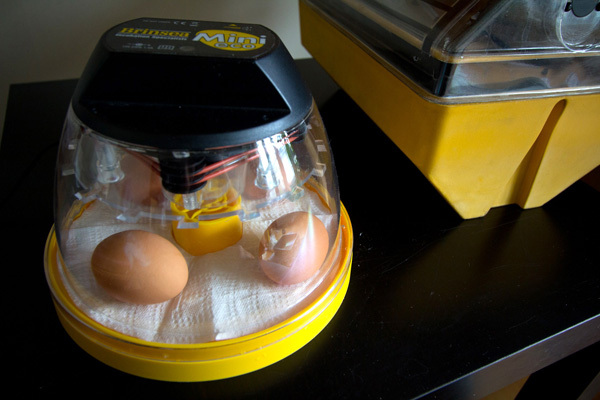 Let your incubator stabilize in temperature and use an independent thermometer (or even two) to check the temperature. You can make minor adjustments at this stage, but be sure to allow the temperature to stabilize again before making further changes. 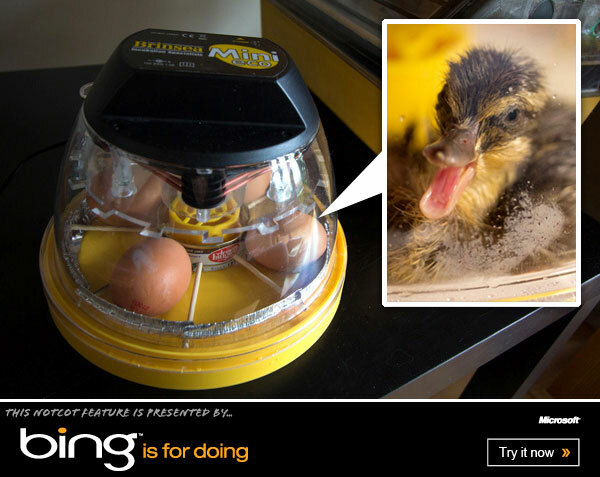 The appropriate temperature will depend on the species you are hatching. 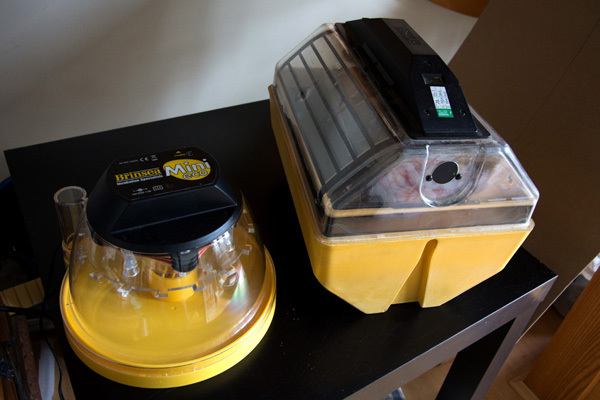 For ducks and chickens this should be 99.5F (37.5C) in a forced air incubator like the ones shown above. Getting the temperature right is quite important. Low temperatures cause developmental problems and temperatures that are too high can cause brain damage and kill developing embryos. That said, healthy stock can handle small temperature fluctuations. Remember, it’s the egg temperature not the incubator temp that is important, so it will take a little bit of time for changes to effect the embryo inside. The goal of incubation is to mimic (and indeed improve on!) natural incubation, so temperature isn’t the only important variable. The broody hen not only keep the eggs warm, she also maintains the humidity and regularly turns the eggs (supposedly to proven developmental problems as the network of capillaries form). Most incubators have guidance on maintaining humidity with integrated pots for water. I’ve found it helpful to use a hygrometer to monitor the humidity levels. Although there are differing schools of thought on the best techniques (you can read 31 pages of forum controversy on the topic here), I found that maintaining humidity at 35-55% during the majority of the incubation, then increasing to about 65% during the last three days has worked well for both chicks and ducklings. They key is to ensure the egg develops properly and you can monitor this by checking the size of the air cell (see more on candling below) and monitoring the weight of the egg. The air cell is the first reservoir of air the chick will breath from before breaking out of the shell. Too small and it will drown, too large and the membranes will become too tough for the chick to break through. Weighing your eggs can help track development. The egg’s weight should decrease by 12% during incubation to produce an air cell of the right size. 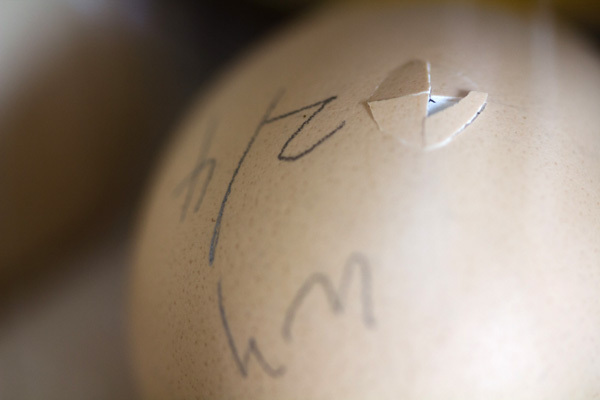 The setting of the eggs will vary with your model of incubator, but as a general rule, the wider end of the egg should be slightly elevated (this should occur naturally if you lay the egg on its side). Do read the guidance that comes with your incubator as chances are the manufacturers have dedicated plenty of time and research to the science and design! If you are hand rotating your eggs, now is the time to use a pencil to carefully and gently mark an X on one side and O on the other to help keep track of your rotations. A clutch of golden pheasant eggs snugly set in the Octagon. While some incubators have egg-rotating devices built in, others (like the one we’ve been using) require hand turning. It is important to turn the eggs an odd number of times per day to ensure that they spend the longest stretch (overnight) in different positions. We’ve found a regime of 5 turns per day (7am, 11am, 3pm, 7pm and 11pm) seems to work quite well, although again, many people only turn 3 times a day and some not at all! The Brinsea Mini Eco has the distinct disadvantage of no egg containment, which makes turning the eggs rather difficult (turn one and it will knock all the others!). It’s also not advisable to handle the eggs too much as every contact is another potential bacterial contamination! 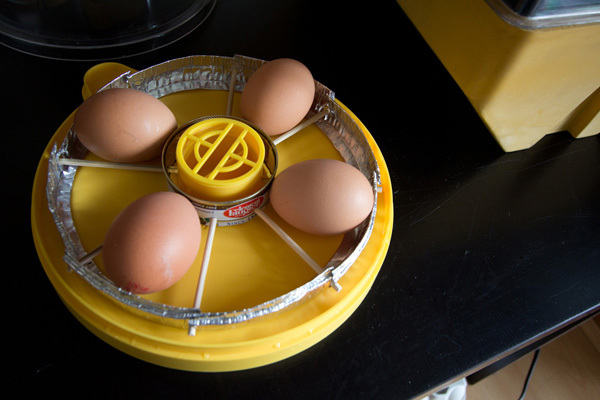 To get around this problem we devise a Heath Robinson-esque egg wheel from a tin can, a pie dish and some bamboo skewers. It’s not the prettiest, but it does mean that all the eggs can be neatly rotated with no direct contact, just turn the can to rotate all of the eggs. Note the eggs pictured above are for illustration only and not fertilized! 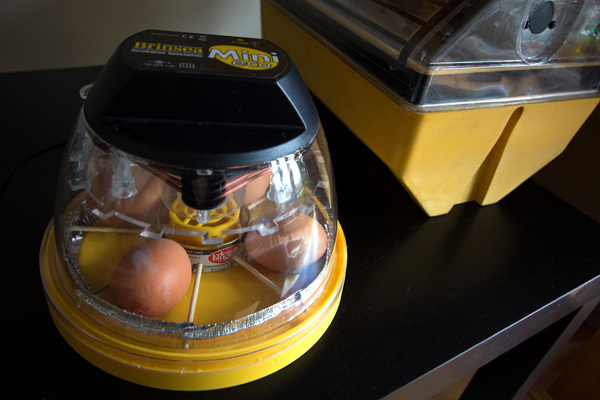 Hand rotating is not the only option though, the advanced version of the same incubator has an auto-humidity monitor and automatic egg rotation. 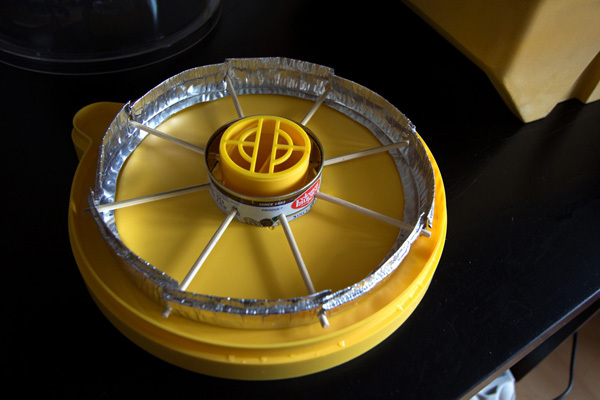 The Octagon models, like the one above, are rotated by turning the entire incubator and letting it rest on one of the other sides. You can purchase a rocking cradle for these incubators which makes the turning process timed and fully automated. You should stop rotating the eggs 2-3 days before they are due to hatch as the embryo is getting into position to hatch. I remove the egg rotation device and line the bottom of the incubator with a textured, absorbent material (paper towels!) to make it a bit easier for the hatching chicks to stand. It also makes the incubator a bit easier to clean! 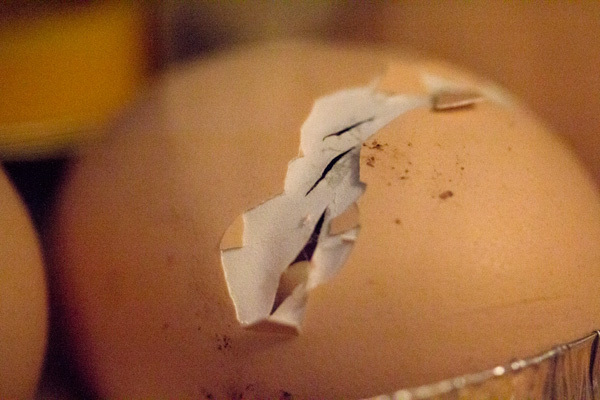 Make sure your eggs are not wedged in, as the chicks will need to burst out of the shell! 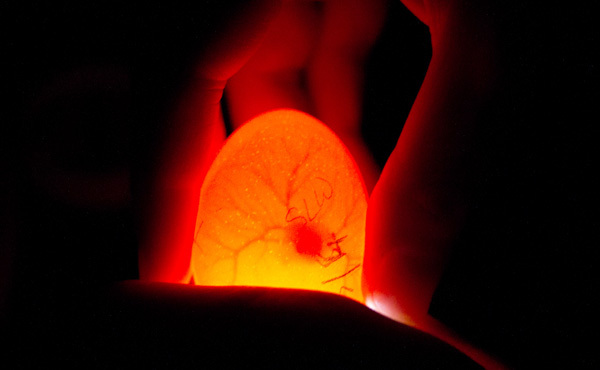 You can monitor development of your eggs throughout the incubation by candling, shining a bright light through the egg. This allows you to get a peek at what’s gong on inside and check that development is progressing. Dedicated candling devices do exist, but a very bring LED flashlight does the job just as well. While the specifics of development obviously vary by species, here’s a rough guideline based on the chicks and ducklings we’ve hatched. The first candling at about 4-5 days will give you an idea whether your eggs are properly fertilized. If they are, you should see a tiny dot (and possibly a heartbeat) suspended in a network of growing capillaries. 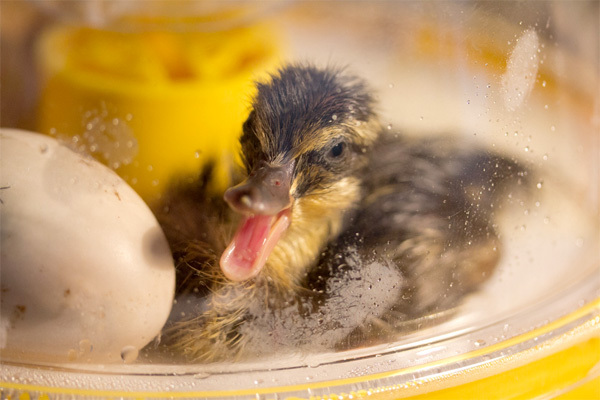 Here you can see a mandarin duckling’s tiny heart beating at 4 days. Here is a chicken embryo moving about within the egg at day 9. A more developed chicken embryo at day 12. For more details of our candling see some highlights in the development of our Wyandotte chicks and Mandarin ducklings. There are also lots of great resources and guides to what’s going on inside, for example these great images of developing chicken embryos and this duck egg candling photo diary. 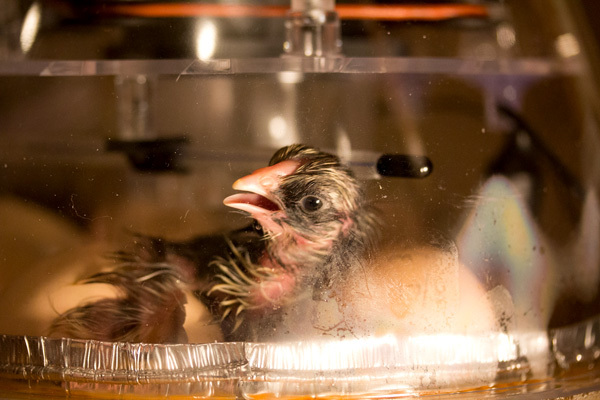 The hatching process begins when the chick pips internally, that is, breaks the membrane into the air cell and begins to breathe the air inside. You can see when this happens by candling and at this point you may hear it breathing and starting to tap on the inside of the shell, as well as emitting tiny little peeping sounds. In our ducklings, this happened up to 72 hours before the duckling emerged! With lots of persistent taping with that little egg tooth, you’ll see the first crack appear. This takes a lot of effort, so the chicks do rest a lot between bouts of tapping, try not to worry too much (but this is almost certainly advice you won’t take!). Throughout this process, the chick inside is drawing the yolk sac inside its tummy and sealing off the network of blood vessels we saw at day 4. This is an important part of the process and intervening too early can kill the babies. When the time is right, they’ll start unzipping their way around the shell, twisting around. They are actually pecking with the head tucked under their wing there’s not a lot of room in there!). Once they’ve turned all the way around, they’ll start to push and you’ll see the membrane tearing open. They really put their back into it and burst out of the shell, a very vocal, damp little baby!